Origin of All Saints' Church Written by the Rev. S. T. Pettigrew, Founder of Bishop Cotton Boys' School, Cantonment Orphanage and All Saints' Church. "My Church (St. Mark's) was already crowded with troops and officers, and there was little room for these poor people (a small colony of European Pensioners.) Hence the necessity of erecting a Church for them, that they might enjoy the means of grace. Such a scheme had been devised four or five years previously, but had come to nothing. A few hundred rupees had been collected and placed in a bank, but all interest seemed to have died out. A small site at the corner of a parade ground seldom used, had been given; this under two successive generals of division I had got enlarged to such an extent as to admit of building the Orphanage on one side with abundant space for the Church in the center. I drew a plan for the Church which, I am happy to say was rejected by the Church building Society of Madras as too small, and was succeeded by one designed by the accomplished Government architect, Mr. Chisholm, fully adapted for the purpose. My time, however was drawing nigh for my hill tour on duty. Every chaplain in rotation had a tour of two years' incumbency on the Neilgherry hills. So the scheme, stirred up afresh, was left for my successor to carry out. "One my return to duty the Scheme was still in abeyance, through the divergent opinions of the Building Committee. A few days after my arrival, however, the Bishop came on visitation, bringing with him the last plan designed by the government architect. The Church Building Committee was called together, and the plan submitted, and seemed at one time likely to share the fate of three former ones, which the committee in their collective wisdom had rejected. One member, an old general, who had a mania for bungalow building and had erected a small town, stoutly stood out for simply enclosing the ground with a wall, and leaving the Church to a future generation. Another member thought the plan too elaborate, and savouring of popery in disguise. Another thought four walls of brick and mortar, with a roof, sufficient to worship God in. The good common sense of the Bishop came to the rescue. His Lordship thought the time had arrived when Churches might be erected in his diocese with greater regard to ecclesiastical propriety. His Lordship thought the design a fitting one. My friends of the Committee, thus hard pushed, did not like to oppose the Diocesan; but a brilliant thought occurred to one of them. Who was to pay for the plan ? Forty pounds, out of sixty or seventy only in the bank; I accepted the responsibility of collecting this money, reassumed the secretaryship on the understanding that I was to be permitted to commence operations at once; and the meeting broke up. "One of my parishioners, with experience in building, had offered his services to superintend, for the love of the work; and so we commenced our labours. The following day the lines of the foundations ere traced out, and a band of Wudders (people accustomed to earthwork), pick in hand, were busily engaged digging the trenches. The estimated cost of building, without any interior fitting was estimated at 10,000 rupees. Having no contractors to deal with beyond those supplying foundation stones and chunam and mortar we were able to build when we have money, and stop when the funds ceased. When my scaffolding of bamboos was raised and people perceived that we were in earnest, funds began to pour in, but the amount to be raised was large. The architect had sent a pretty sketch of the Church as it would appear when completed. This I had photographed and placed at the heard of a subscription card, and given to collectors wherever I had friends in India. We had some valuable gifts. The Principal of Cooper's Hill Cottage presented a beautiful western Rose windows, to the memory of a beloved child. Alter, vestments for it, Pulpit, Fond, Reading-desk, Communion plate, and Altar Cross quickly followed. The shell of the building was completed for 8000 rupees that is Rs. 2000 under the estimated cost. "The next step was consecration. The Bishop was in England on sick leave. 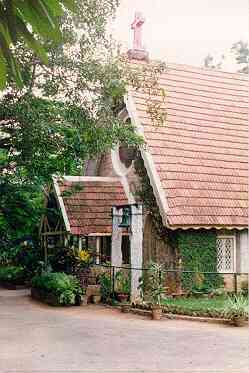 Fortunately Bishop Milman was on a tour of visitation at the time, and kindly promised on his way to the "Blue Mountains, the Neilgherry Hill," to visit Bangalore, and consecrate the building for us. The he promised with his usual beautiful self-denial whenever work was to be accomplished, more especially his Master's work, for it sadly curtailed his visit to the Neilgherry Hills where he had hoped for a rest. "The Church was built and consecrated, and where was the Parson? It had been erected by Private Enterprise to meet a want of the District. Government had given no aid whatever towards its erection, and so the Church Building Committee had the matter entirely in their own hands. They considerately left the disposal of the Incumbency in my hands. So I proceeded with the task. It had always been understood, that when the Church was erected the duty of serving it should first be offered to a clergyman who, traveling at the expense of Government, relieved the chaplains of much of their out-station duty. He was available to assist them at times when they were compelled, which was only once every quarter, to the absent. To this gentleman, then, the Incumbency was primarily offered - the compliment was acknowledge and declined. "Now was the opportunity for, daily services, weekly Eucharist, and a fitting ritual. During my tour on the hills I became acquainted with the Rev. Dr. Pope who had a college there, and assisted the chaplain also. On my return to Bangalore, and the completion of the Church, I found myself in communication with him about the Wardenship of Bishop Cotton School and College. He was unwilling to accept the appointment without some definite clerical work, and here the opportunity presented itself. The result was all that could be desired. Daily services were instituted, the boarders of the college formed the choir, and for many months the services were celebrated purely for the love of the work. At last Government, shamed into action, gave a tardy annual honorarium to the priest in charge. He was a scholar and divine, and had for his literary abilities and missionary work, obtained the title of D. D. from the University of Oxford. 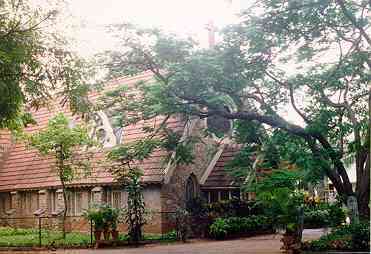 And thus, All Saints', Bangalore, was build AD MAJOREM DEI GLORIAM." * Rev. G. U. Pope, D. D., from Oct. 1871 to Jan. 1882. * Rev. T. H. Hildesley, M. A., from Jan. 1882 to Feb. 1884. * Rev. H. C. Parker, M. A., form March 1884 to May 1997. Rev. Thomas Johnson, from May 1887 to July 1888. Chaplain of St. Mark's from Aug. 1888 to Aug. 1889 - in charge. Rev. S. H. Honston from Sept. 1889 to April 1890. Rev. W. E. Douglas, B.A., from April 1890 to March 1893. Rev. J. W. Foley, M.A., from April 1893 to Aug. 1893. Rev. S. H. Johnston from Sept. 1893 to Dec. 1895 - Church Chancel extended 11th June, 1894, Parsonage Foundation stone laid 1st November, 1894. Rev. A. E. Burton, M;A. from Dec. 1895 to Dec. 1896. Rev. W. Muspratt from Jan. 1897 to April 1900. Rev. G. H. Smith fro April 1900 to Dec. 1900. Rev. J. W . Foley, M. A. fro Dec. 1900 to June 1907 - Cannon of Madras, 1902. Rev G.H. Lamb, M. A. from June 1907 to Aug. 1907. Rev. H. Pakenham Walsh, M. A., D. D, from Aug. 1907 to Oct. 1910 Bishop in Assam 1915-1924. Rev. Canon J. W. Foley, M.A., from Nov. 1910 to April 1924. Rev. R. W. Chester, M.D., from May 1924 to July 1927 - Assistant 1923-24. Rev S. B. Stephens., B. A., from July 1927 to Jan. 1932 - new Pulpit, Lectern Altar Rails. Chaplain of St. Marks from Jan. 1932 to Nov. 1935 - In charge. Rev. S.J. D'Morias, B. A., B.D., Nov 1935 to Nov. 1936 - Assistant 1993-35. Rev. I.D. Day from April 1938 to Dec 1938. Rev S. B. Stephens., B. A., from Jan 1939 to Aug 1940. Rev. N. L. Nyss from Sept. 1940 to Sept. 1963. Rev. E. L. Poyser from Oct. 1963 to Jan. 1964. Rev. Sam. D. George, Assistant. * Warden, Bishop Cotton Boys' School. 1. The aim of this short article is to give friends and well-wishers of All Saints' Church an idea of some of the more important events and functions held or being held after the constructions of the Church. At the very outset we would like to apologise for any shortcomings. omission, or inaccuracies in this article, but this is due mainly to the fact that records are not available, and memories are short. Rev. E. L. Poyser : Did some most sincere and grate service to the Church for several years., He will be best remembered for composing and writing several beautiful hymns which have now been presented in a Red Book and still used in the Church as Vespers. Rev. A. V. Ramiah : In spite of being blind did some wonderful service n the Church by regularly attending the Sunday Services, taking the latter part of Evensong, and for his most illuminating Sermons. Rev. Ince : For valuable services rendered not only in the Church but in other activities also. Rev. E. Paramanadal : Was a most willing and cheerful helper until his sad and sudden demise on 17 August 1969. Rev. Canon John Asirvatham : For his devoted, loyal and ever willing services by assisting and taking services till he left Bangalore in July 1970. 1954 Lectern Bible presented by S. P.C. K through Canon Foley. The above article is an extract from the Centenary Celebrations Souvenir of All Saints' Church.